La-Mulana isn't just a celebration of a moment in gaming history, it's a distillation of rose-tinted memories and savvy design that manages to completely transcend the very games it hopes to imitate. A thoughtful love-letter to the MSX home computer, it's a childhood's worth of memories brought to life, somehow better than the real experience ever was. The MSX was something of an underdog as a gaming platform. Despite the 4 million units sold, the dated video hardware – the very same used by the ColecoVision and SG-1000 – couldn't compete with Nintendo's Famicom, and it didn't get great third party support, except from Konami. But Konami loved the MSX, and legendary classics like Castlevania, Metal Gear, and Snatcher all called the platform home. 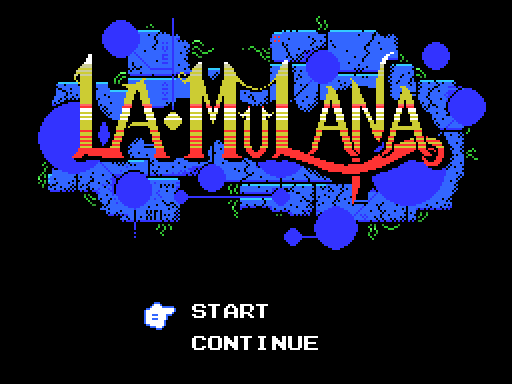 So it is fitting, then, that La-Mulana draws most heavily from these games. The most obvious influence is the open-ended platform-adventure Maze of Gallious, but you'll see winks to a lot of Konami's greats littered throughout. The atmosphere of MSX is thick, from the recreated MSX boot sequence to the lo-fi MIDI blips that comprise the fantastic musical score. 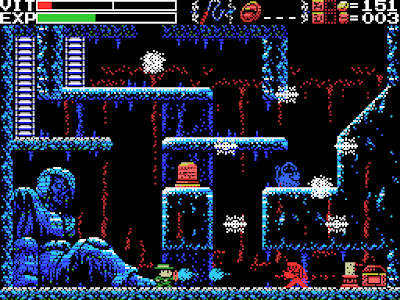 The developers here have chosen to impose some of the limitations of the MSX hardware on themselves, using the same limited palette and a lot of monochromatic sprites. Of course, they've cheated a bit; there are a lot more colours used per tile than the MSX could comfortably pull off, and there's a lot more detail than you'd be able to pack onto a tiny cart. The end result is something that keeps the recognizable look of an MSX game, but ultimately looks a lot better than anything the system ever saw. La-Mulana tells the tale of an explorer bearing a less-than-coincidental likeness to Indiana Jones as he traverses the titular La Mulana ruins. The size and scope of the quest is really quite overwhelming. The world stretches over 400 screens, packed with puzzles ranging from simple to downright cryptic. It can be quite intimidating, in fact, as the games it romanticizes often were. There is little to guide you, and progress is anything but rigid, so a healthy amount of patience and a love of exploration are requisite for would-be adventurers. It makes progress a bit tricky, but all the more rewarding in the end. 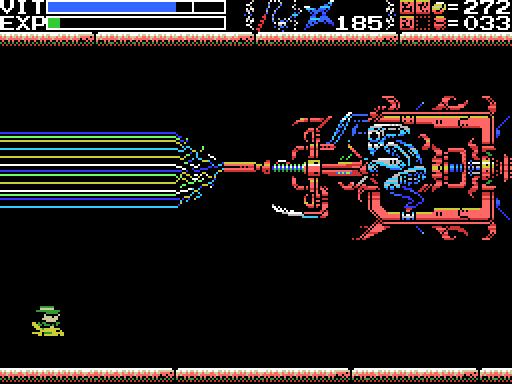 In classic 8-bit fashion, the difficulty can be quite merciless, as well. RPG levelling elements help ease the pain a bit, but there's little escaping the amount of trial and error involved. It's a satisfying difficulty, though, and once you gain the ability to warp around, travel becomes much easier. My biggest gripe is the way many puzzles rely on weights and money randomly (and infrequently) dropped by enemies. It can be frustrating when you can't solve a puzzle simply because fortune has not yet smiled upon you with the item you need. Despite these minor complaints, it's hard to deny that this game hits its mark dead-centre. 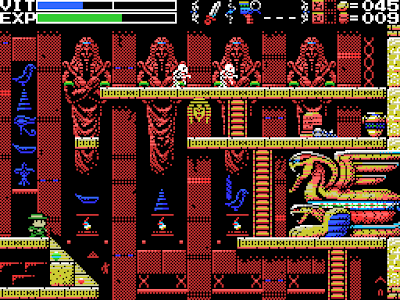 As a faux MSX game, it holds up to the system's classics. 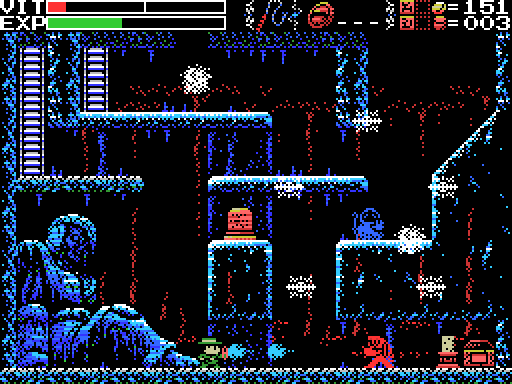 As a homebrew freeware platformer, it stands with Cave Story among the finest of its kind. The careful attention to detail and perfectly recreated atmosphere tantalize the sense of nostalgia, but ultimately it's just the expansive quest, quirky humour, and classic whip-cracking game-play that make it a choice way to while away the hours, even for those not fortunate enough to have played on an MSX. Download the English translation of the game here (from the Aeon Genesis website).